Annual Report 2015 — Empower Playgrounds, Inc. Ten years ago, I first contemplated an approach to provide improved educational opportunity to children in rural, off grid schools. The idea would involve play, hands-on learning and light for evening study. With strong support from interested individuals, students, professors, practicing engineers, small companies and large corporations, all of whom embraced the concept and were willing to contribute, a very successful model was developed. It includes much state-of-the-art technology and innovative processes. Most importantly it truly works and makes a huge difference in the lives of real students. EPI has built effective relationships with the schools where our systems are deployed, and with the school districts. This has opened opportunities to leverage our efforts and provide additional resources such as library books and improved classrooms to people we know will use them wisely. We will continue to build on those relationships in our second decade. Our promise that every dollar donated to EPI would go to directly benefit the children has been met. My wife and I pay all administrative and overhead costs and plan to continue to do so. This encourages efficient use of funds. Be assured that when you make a donation to EPI, children in rural schools are directly benefited. EPI started the first decade with a good concept, but a lot of unknowns regarding actual implementation. After successfully solving many unknowns, we begin our second decade with an established framework for success. This provides many children with a real opportunity for quality education which was not previously available. Thank you for your support, you provide the fuel to move the dream forward! My first merry-go-round installation was in July of 2014 at Afransua Dedewa Primary School. At the installation there were only 80 students enrolled and even fewer were in attendance. I just received a report that there are now 108 enrolled and attending regularly. The Headmaster attributes this growth to the installation and use of our project at their school. Community members start to feel a renewed sense of hope for their children’s future and a greater desire to invest in their education when they see our support. The story of Afransua Dedawa is one we are hearing more and more as we continue our relationships with our schools. I feel honored to be a part of this project and the impact we have. Thank you for being a part of this great work. Together we are making a difference. Empower Playgrounds, Inc. enhances educational opportunities for children in deprived villages by providing renewable energy through electricity-generating playground equipment, smart LED lanterns, and hands-on science kits. The first merry-go-round was installed in 2008 in partnership with many Empower Playgrounds supporters--including Brigham Young University. Currently we our schools have 10,250 children enrolled with 1414 lanterns and 46 merry-go-rounds installed--Including one installation in Mali. In 2015, 5 new merry-go-rounds were installed adding 800 new children to the EPI family with 180 lanterns and lantern groups. Since 2012, Empower Playgrounds Inc. has been working with partner, Thames and Kosmos, to distribute science kits to schools in Ghana so that students will have hands-on experience when learning about technology and engineering. These science kits include topics on Motors and Generators, Magnetic Science, Solar Power, and Learning Circuits. This year, EPI introduced a new science kit on Electricity and Magnetism with more than 60 experiments. Students create circuits and magnetic contraptions to learn how these two fundamental properties are related. EPI employees train teachers on effective use of these kits and then continue to regularly follow up with schools on their proper upkeep and implementation within the science curriculum. This year 300 science kits were distributed to our schools, for a total of 800 science kits delivered. Empower Playgrounds installed the Light-A-Village charging station in 2013 on Pediatorkope Island. The charging station uses solar panels to charge batteries that villagers use to provide power in their homes. Currently, 11 homes are using the renewable energy provided by the LAV system. These homes use the electricity to power lights, radios, and cell-phones—a few have even connected televisions to watch local soccer matches. So far, EPI has installed two BioFil Toilet systems – one in Bahankra and one in Nwowom. Both of these systems are still in use today. These facilities are an innovative way to eliminate waste in a sanitary and odorless manner. The BioFil toilets are installed at the schools but are used by the entire community. In many rural communities, children have to walk 3 miles to fetch water. Oftentimes, their water sources are not clean and lead to many serious health problems. In 2015, the boreholes provided by EPI to Bahankra and Attabui continue to provide safe and clean water for students and community members. In 2015, EPI raised funds to completely renovate the school. EPI upgraded the original classroom blocks, added a new classroom, as well as replaced a stick canopy, a dirt floor, and wooden walls. The classrooms were outfitted with new desks and chalkboards. 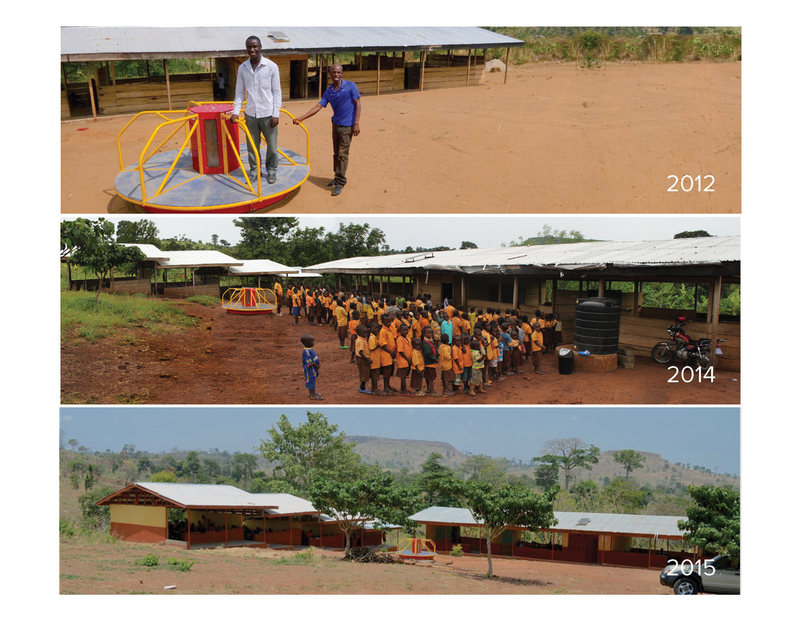 Following these renovations, the Ghanaian government built junior high classroom blocks. The pictures to the right illustrate the significant impact Empower Playgrounds has had on the community of Bahankra. The time line to the right tracks our impact in Bahankra since the installation in 2012. Most notably, when the EPI team first visited the school, there were only 70 students and 5 teachers. Now, the school has over 360 students and 20 teachers. 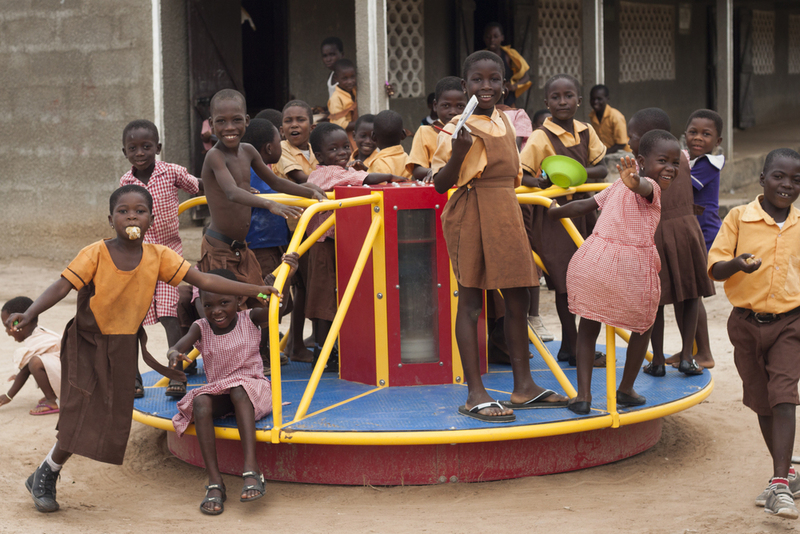 Empower Playgrounds installed the first ever merry-go-round in Africa outside of Ghana. George and Isaac went to Mali to install the merry-go-round at Ferekoroba Primary School that has 215 students and 7 dedicated teachers. 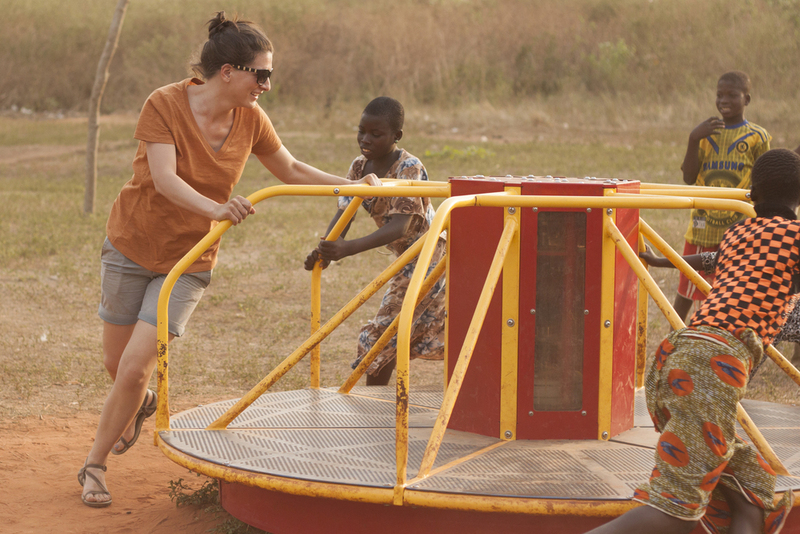 Empower Mali sponsored the cost of the merry-go-round and EPI covered the cost of installation, travel, and delivery. In 2015, the Michel Foundation donated 7 indestructible soccer balls from the One World Play Project. We were happy to deliver them to our schools and the children were even happier to receive them. 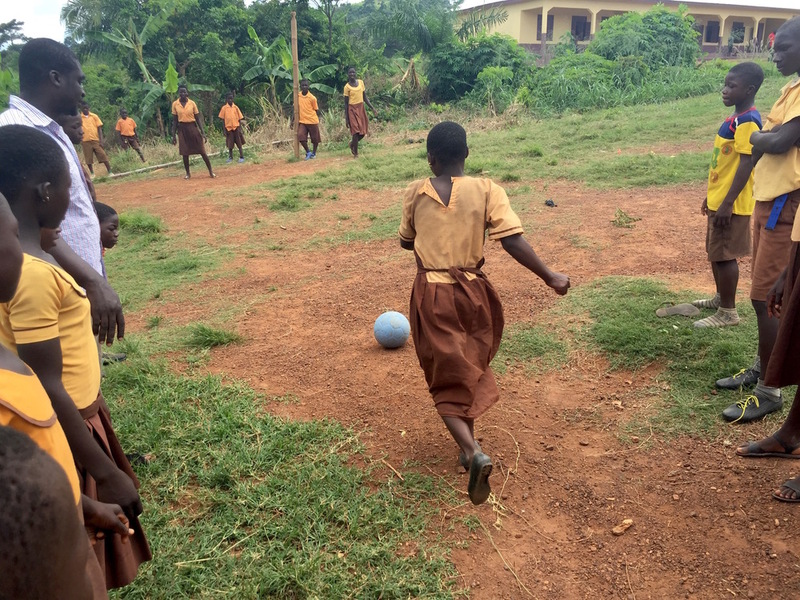 Indestructible soccer balls can be punctured and they will not deflate, perfect for the environment of the rural schools of Ghana. One million Pencils for Africa, donated 2000 pencils to EPI in 2015. One Million Pencils for Africa sells pencils designed with artwork. For every one pencil they sell, they donate one to be sent to Africa. This year, Empower Playgrounds Inc. hosted our first charity breakfast event to raise funds to rebuild the classroom in Bahankra. More than 80 friends of EPI enjoyed a traditional Ghanaian breakfast of bofrot while hearing addresses from our guest speaker, Professor Aaron Miller, and founder, Ben Markham. To cap off the event, our donors were treated to a private viewing of our new film, “Lighting the Night: Mirabell's Story”. Donate books or volunteer as a book donation leader. Lead your community or school in donating 1000 books to help add libraries to our schools in Ghana! Donate money or time to our great projects. Volunteer as an editor or share your other skills. Contribute to EPI by looking over grant applications and other documents before we publish to make sure there are no mistakes! Volunteer with us in Ghana! Start planning your trip to come visit our projects in 2017! Help install merry-go-rounds and libraries, teach science kits, and meet the beautiful children we serve!